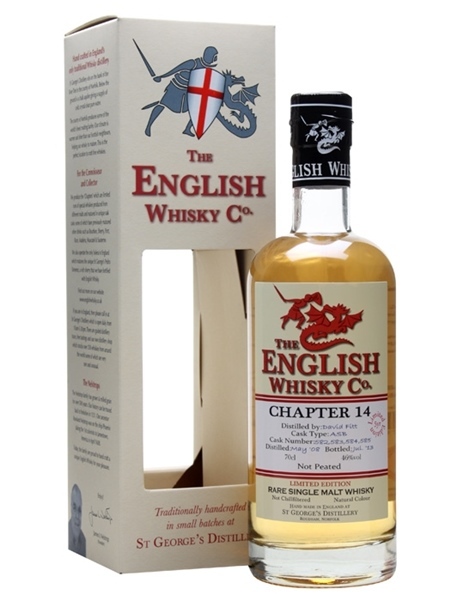 The English Whisky Company was founded by Andrew Nelstrop in 2006 at their family farm in Norfolk, south east England becoming the first distillery in England in over 100 years. They produce single malts, both peated and unpeated and use a variety of casks for maturation. The whisky style is light, elegant and fruity. The branding concept comes from a view that each new whisky expression released tells a new part of the story of The English Whisky Co - thus the chapters. Chapter 14 was voted European whisky of the year in 2015 by Jim Murray and is part of the distilleries core range. It's an unpeated, fruity single malt, non-chill filtered and natural colour. The bottle we have was distilled in December 2010 and bottled in February 2016. This release is from a vatting of 4 ex-bourbon casks and bottled at 46% ABV.